The main reason to discuss the BRIC countries is because they have been in the spotlight as developing countries – the so-called second world countries. But what we see is that these countries are developing very fast and well. The current crisis and the lack of future resources for today’s western countries are a huge boost to the potential of the BRIC countries. They have all the preconditions to bring about a global shift in the economy. 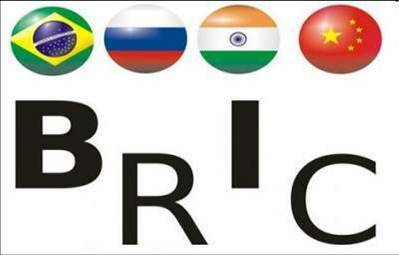 The BRIC economies together will outperform the current G6 industrialised countries in the coming decades. China is already the second player in the world economy (India is 5th). Internationally-oriented companies and companies facing growing imports in their markets should not only monitor but act on this trend if they have not done so already. These BRIC countries do not follow the entire development, but start immediately where there is an opportunity. So they are not impeded by old infrastructure, barriers in knowledge development or investment in the queue. Brazil is a prime example of how technology and development go hand in hand. Here they have invented the concept behind the ‘provoking lag’. China, Russia and India are given more prominence than Brazil, but Brazil has much to offer. For a lot of investors Brazil is the most interesting country. A growth of 5-6% is expected. 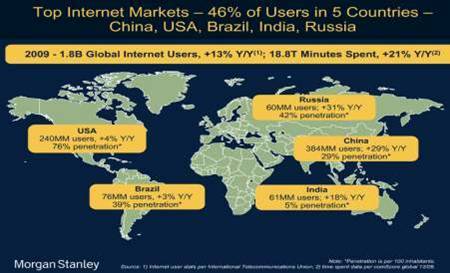 Forty-six percent of internet market users come from the BRIC countries and the USA. And if this is not enough there are a few more “waiting for us”. Fast-developing upcoming areas are Turkey, Egypt, South America, Chile and Indonesia. Europe has become less interesting for investors looking for growth opportunities. And our organisational structures are too complex. Brazil is an investment county par excellence, even for the Chinese. Investors are lining up to fund any great initiative on offer. Technical developments are happening fast: even the Favelas have WIFI. As their infrastructure is not developed, they can omit several steps. There are no discussions via cable, but there is full access to all new technologies instantaneously, and an incredible level of global innovation. Sharing is common practice and there are no privacy issues. Developments such as collective purchases, recommendations, location-based services and e-commerce are the norm. Brazilian entrepreneurs have a high need to excel. The political climate is favourable. Start-ups achieve great success and they are already investing in other Latin American countries and the USA. The Olympic games and the football World cup will give them an additional boost. Sustainability is a natural component of entrepreneurship for them. Brazil could be eco-superior in the future. Marketers should see and use Brazil as a knowledge nation. If you follow the developments in new media, sustainability and innovation, you will keep up with the trends automatically. Especially superior graphics and design are very inspiring and innovative in the field of social media. For more trends go to http://www.pimonline.nl and register for the newsletter, you will receive the trendreport. Profit-Marketing is het bedrijf dat winst maakt voor uw onderneming door marketing. Interim-management, social media, marketing, communicatie, innovatie, coaching en trainingen. In mijn blogs schrijf ik divers over nieuwe ontwikkelingen, management ervaringen en social media.